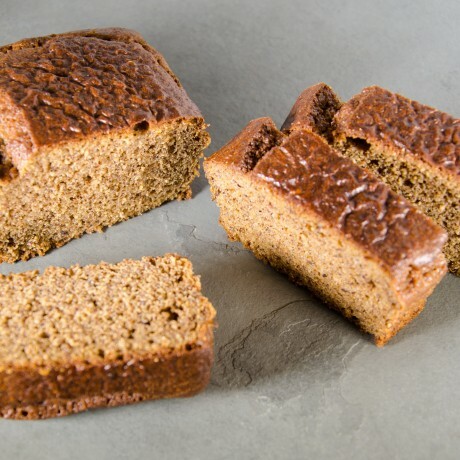 Warm banana loaf smothered in almond butter or drizzled with honey makes a perfect breakfast - but this bread goes beautifully with savouries too. Try it with smoked salmon or ham. It has a firm consistency making it ideal for lunch boxes or picnics. Its protein profile is high due to the amount of egg that contains, combined with the almond butter. And, by the way, we make our own almond butter to use in our products. The room smells delicious when we roast the almonds! This bread could become your morning staple for weekdays when you don't have the time to prepare breakfast. Refrigerate and consume within 3 days. Otherwise slice and freeze for up to 1 month.